Distribution: The cackling goose, formerly known as the Aleutian Canada goose, breeds off the coast of Alaska on the Aleutian and neighboring islands and winters in the Sacramento and San Joaquin Valleys. Although there are no known occurrences within the Natomas Basin, the species may stop over in the basin’s marshes and agricultural fields on its way to nearby wintering areas in the southern San Joaquin Valley. A small population does winter to the north along the border of Colusa and Sutter Counties. Habitat Requirements: In the winter, cackling geese require inland lakes and marshes that provide roosting areas protected from predators. Their winter foraging habitat consists mostly of agricultural lands such as flooded rice fields, pastures, and crop stubble where they consume grass, sprouted grain, and waste crops following harvest. Their breeding habitat consists of tundra on grass-covered islands that are inaccessible to mammalian predators. Reproduction and Demography: The cackling goose generally creates a nest on an elevated platform of grass or sedge, adding vegetation and a lining of down as egg laying progresses. The female lays an average of five eggs, which she incubates for just under four weeks. When the young hatch, they are covered in down and can walk, swim, and feed themselves. They leave the nest within 24 hours, relying on parents for protection from predators and for guidance to foraging areas. Movement: In the fall, the cackling goose migrates south, appearing in California in mid-October through November. Offspring and adults leave the breeding area together. In the spring, departure for the north can occur as early as January but generally occurs between February and April. Ecological Relationships: The cackling goose was one of the first species listed under the Endangered Species Act due to severe declines following the introduction of nonnative foxes to its island breeding habitat. Starting in the late 1960s, removal of the introduced foxes allowed recovery of nesting populations, and the cackling goose was removed from the endangered species list in 2001. 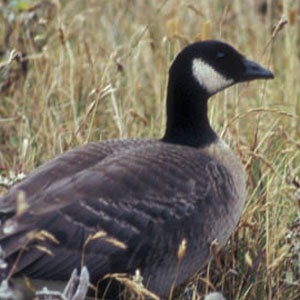 The cackling goose plays a role as a grazer in short-grass vegetation communities, affecting the vegetation on its breeding islands and wintering grounds. Mammalian predators are now generally absent from the islands on which the geese breed, but the geese may be preyed.